Our pre-school classes follow the Melody Movement syllabus. Melody Movement Early Learning introduces children to dance and movement using the natural actions of the body such as running, walking, jumping, hopping, skipping and galloping. It is a structured syllabus to aid children's physical development, co-ordination, spatial awareness, creativity and self expression. 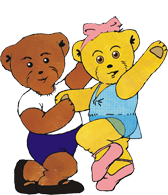 Melody Bear is introduced to and dances along with the children. All children are encouraged to bring their own soft toy to each class. Each class is based on children's stories and adventures, there will be opportunities to not only dance, but dress-up, sing and play musical instruments. Each term is based on 6 weeks, where each child will receive sticker and work cards. There will be stickers to collect each week, and when two cards are completed (i.e. 12 weeks) a medal will be presented. All folders, stickers, collection cards and medals are included in your terms fees - no extra cost will be involved unless you require replacements. Our pre-school students are included in all ADA Shows.